We’d love your help. Let us know what’s wrong with this preview of A Prayer for the City by H.G. Bissinger. A Prayer for the City is Pulitzer Prize-winning journalist Buzz Bissinger's true epic of Philadelphia mayor Ed Rendell, an utterly unique, unorthodox, and idiosyncratic leader who will do anything to save his city: take unions head on, personally lobby President Clinton to save 10,000 defense jobs, or wrestle Smiley the Pig on Hot Dog Day--all the while bearing in mind the A Prayer for the City is Pulitzer Prize-winning journalist Buzz Bissinger's true epic of Philadelphia mayor Ed Rendell, an utterly unique, unorthodox, and idiosyncratic leader who will do anything to save his city: take unions head on, personally lobby President Clinton to save 10,000 defense jobs, or wrestle Smiley the Pig on Hot Dog Day--all the while bearing in mind the eternal fickleness of constituents whose favor may hinge on a missed garbage pick-up or an overzealous meter maid. It is also the story of citizens in crisis: a woman fighting ceaselessly to give her great-grandchildren a better life, a father of six who may lose his job at the Navy Shipyard, and a policy analyst whose experiences as a crime victim tempt her to abandon her job and ideals. To ask other readers questions about A Prayer for the City, please sign up. This was certainly an odd choice for me to read while on vacation, i.e. not in Philadelphia, but such is the library hold queue. The author spent four years embedded in the first administration of Ed Rendell as Philadelphia mayor (1992-95) and wrote about all the highs (rescuing the budget) and lows (losing the Navy Yard). He had total access to Rendell and his chief of staff David Cohen, whom I liked better after reading this book because I've only heard of him as the the chief lobbyist of Comc This was certainly an odd choice for me to read while on vacation, i.e. not in Philadelphia, but such is the library hold queue. The author spent four years embedded in the first administration of Ed Rendell as Philadelphia mayor (1992-95) and wrote about all the highs (rescuing the budget) and lows (losing the Navy Yard). He had total access to Rendell and his chief of staff David Cohen, whom I liked better after reading this book because I've only heard of him as the the chief lobbyist of Comcast, an outright evil job. The other thing I found a little disappointing about this book is that it only covers Rendell's first term as mayor and so, in 2016, reads as being unfinished or ending in the middle of the story. I think of Rendell's tenure, overlapping my high school and college years, as the time when the city changed from being a place my family hardly ever went to (despite living 15 miles away) to being a place I wanted to live in. One thing I remember about Rendell is that at the end of his last term in office, he had a reception for people to take pictures with him, an event which went hours overtime because so many people came, such was his popularity. But as for any of the specific achievements of his second term, I don't remember them and they're not covered here. If you loved the West Wing TV series, there are good chances that you’ll like this book. The author somehow finagled permission to be a fly on the wall during the Ed Rendell’s first term as Philadelphia’s Mayor (1992 – 1995), embedding himself in the Chief of Staff’s office, sitting in the shadows during executive meetings, even listening outside the door during tense confidential negotiations over navy yard reuse proposals. Readers are granted shockingly unfettered access to the internal workin If you loved the West Wing TV series, there are good chances that you’ll like this book. The author somehow finagled permission to be a fly on the wall during the Ed Rendell’s first term as Philadelphia’s Mayor (1992 – 1995), embedding himself in the Chief of Staff’s office, sitting in the shadows during executive meetings, even listening outside the door during tense confidential negotiations over navy yard reuse proposals. Readers are granted shockingly unfettered access to the internal workings of city government at the highest level – we are spectators at the Administration’s finest hours and most cringe-worthy stumbles. I’m still amazed at what Bissinger was allowed to witness. The book offers thoughtful, poignant portraits of two men - Mayor Ed Rendell and his Chief of Staff, David Cohen – and in so doing, it offers insights into what it takes in terms of temperament and time allocation to excel at those jobs. We vote for Mayors, but do we actually know what they do, what they can do, to “create change”? Bissinger makes a compelling case that one of the Mayor’s key contributions was his relentless cheerleading: Rendell’s optimism “changed the entire feel of the city, to the point where the perpetual focus wasn’t on the litany of problems, but on what maybe, just maybe, could be done. As if by constantly talking about all that might be coming and planning for it as if it were already here, it somehow was already here. In a way, he wasn’t America’s Mayor but America’s first publicly elected cult leader, winning hearts and minds of hundreds of thousands on the basis of blind faith.” Even if he did have to do it by wrestling with six-foot pig mascots to promote a local hot dog business, or undertake any number of ridiculous shticks to market the city as an entertainment destination for suburbanites with money to burn. My only reservation is that the narrative flow can feel like learning to drive a manual transmission – the adrenaline rush of union stand-downs and navy yard sale negotiations screech to a halt for a profile of a Philadelphia resident. I understand that the author included these profiles to give the reader a visceral image of the people whose lives hang in the balance, people like a soon-to-be laid-off welder, an African-American grandma raising her great grandkids in a crack neighborhood, a yuppie couple who are driven from their Center City townhouse after one too many violent crimes, etc. It’s all good content, it’s just awkwardly shoe-horned into the Rendall Administration story in a way that’s distracting at best and deflating at worst. What Bissinger has written is both paean and elegy to the once grand, once thriving American city. The focus is Philadelphia, but the story represents the plight of all the large urban centers across the country - cities whose "revitalized" downtowns are deceptive, "a brocade curtain hiding a crumbling stage set." It's hard to believe that Ed Rendell, newly elected mayor of Philadelphia, would allow Bissinger to follow him around for four years, giving him access to meetings, policy debates, and What Bissinger has written is both paean and elegy to the once grand, once thriving American city. The focus is Philadelphia, but the story represents the plight of all the large urban centers across the country - cities whose "revitalized" downtowns are deceptive, "a brocade curtain hiding a crumbling stage set." It's hard to believe that Ed Rendell, newly elected mayor of Philadelphia, would allow Bissinger to follow him around for four years, giving him access to meetings, policy debates, and personal melt-downs. I am astonished. And I'm inclined to agree with the author's view that Mayor Rendell is "a man unafraid to be human." Ultimately though, Rendell, and his passion to save Philadelphia, is not what fascinated me the most. What the book did is lift the manhole cover on the political machinations, both good and terrible, that keep government snaking along. Do we need government do help us maintain a civilized society? I think we do, but what a sewer! I admire the noble efforts of politicians who enter this befouled environment in order to make a difference, a better life, for their constituents. What they're up against is beyond description, although Bissinger does justice to the attempt. Poverty, racism, drugs, crime, fear, despair, poor public schools, abandoned factories, little health care, and a culture of public dependence. That's the short list. Although I found this book seriously depressing, I also came away feeling something of the spirit of confidence and hope that all is not ruined. I admit that I'm deeply cynical about politicians and the legislative process - government policies are so often grossly damaging - but this book makes clear that there are people willing to make painful sacrifices for the greater good. I don't know if a better book has been written about local politics. This book may be one of the best ones I've read about politics, period. It's a dizzying portrayal of a big city mayor trying to navigate the shark-infested waters of public employee unions, the media, state and federal government, job loss, white flight, and more. It's both engrossing and deeply depressing. Not perfect (Bissinger lays it on a bit thick sometimes), but overall I loved it. There's a good book to be found in the text of this book; the political chess-playing on its own would make a three-, maybe four-star book. But as it's presented, Bissinger's too fundamentally dishonest and crowd-pleasing in his presentation for this to merit serious consideration as meaningful nonfiction. He seems to lack all respect for his presumed audience, between his narrative gimmicks and the sheer transparency of his emotional manipulation; it comes across as an insecurity in the strengt There's a good book to be found in the text of this book; the political chess-playing on its own would make a three-, maybe four-star book. But as it's presented, Bissinger's too fundamentally dishonest and crowd-pleasing in his presentation for this to merit serious consideration as meaningful nonfiction. He seems to lack all respect for his presumed audience, between his narrative gimmicks and the sheer transparency of his emotional manipulation; it comes across as an insecurity in the strength of the story he's chosen, which is unfortunate, as it was strong enough without his intrusive modifications. Some of this is small stuff, like his providing gratuitous details to no purpose (half a page listing Philadelphia's firsts, half a page of the names of ships built at the navy yard, etc. ), which feels mostly like an attempt at padding out a term paper; he might argue that such expansive lists were included to impress sheer scale upon the reader, but simple numbers would be sufficient to impress that same scale. His choice, too, to take intermittent excursions from the overtly political bulk of the text to drop in on the lives of four citizens feels like another misjudgement of his audience, like either desperate attempts to keep his audience from getting bored or periodical reminders that this book's story of politics is a fundamentally human one, as if that could ever be forgotten. His personal biases also come across without much effort made toward concealment (and the efforts that are made are so lackluster as to have the effecting of highlighting), and without even bothering forth arguments in their favor, let alone successful ones. I grew up in Philly, spent 16 years of schooling there, and now live in South Jersey and still work in Philly. I learned more about the city during the 1.5 weeks I was reading this book than I did in all that other time combined. The depth of the reporting, the range of stories covered, the ability to sort through reams of information-- it's all really impressive. But it's not just a Philly book-- it's a book about the slow decay of the American city and the ways people have tried to combat that I grew up in Philly, spent 16 years of schooling there, and now live in South Jersey and still work in Philly. I learned more about the city during the 1.5 weeks I was reading this book than I did in all that other time combined. The depth of the reporting, the range of stories covered, the ability to sort through reams of information-- it's all really impressive. But it's not just a Philly book-- it's a book about the slow decay of the American city and the ways people have tried to combat that death, with all the inherent political mess that comes with that territory. Although the 92-96 timeframe may seem dated, it's actually more fascinating now to see it because the book opens with Mayor Rendell saying his economic plan will shape the city for the next 25 years. 21 years after that proclamation, it's possible to really see where some of the changes in this city are rooted. As an inside look at how politics gets done in a big city, this is pretty much unparallelled, and all of its observations about how cities have been abandoned and screwed over are pretty much right on the money. So why didn't I like this? I think Bissinger's writing is pretty unimpressive - the whole thing has these weird macho New Journalism airs about it, which I recognize as an attempt to spice things up but feels a little overcompensating. Nevertheless, it's 100% necessary reading for unders As an inside look at how politics gets done in a big city, this is pretty much unparallelled, and all of its observations about how cities have been abandoned and screwed over are pretty much right on the money. Recommends it for: fun if you live in Philadelphia because he cites many places in the city. details of the operations of a unique city and it's unique mayor. details the life and times of ed rendell (then mayor, now governor) and makes you idolize the man- if your a hard working liberal that is. even if you don't like rendell, you'll learn a lot about him and a lot about what has happened to make philadelphia the way it is today. The author was given complete access to Philadelphia Mayor Ed Rendell during his first term and the book shows the inner workings, both the good and the bad, of running a big city. Our increasing nationalization of politics at both the federal and state level is so very depressing. And local politics is not immune from these pressures, but to me, there are still signs of cities functioning as laboratories of democracy. Lo and behold, about a year ago the Amazon robots (or whatever they use to send us cheap deals for our e-readers) thought I would enjoy a 1997 book about Philadelphia. Maybe the robots knew I had loved Friday Night Lights, or that my remaining Jersey side of the family has made the trek from Newark to Middlesex County to South Jersey. Or maybe it knew that I have an undergrad political science degree. No matter the reason, the robots were so on point about this one. Simply put, this is one of, if not THE finest books about governing that I have ever read. And I've read your Teddy White's, and your Hunter Thompson's, and your Game Changes, and your McCullough biographies. Maybe what sets it apart is that the campaign (usually the much sexier part) is so very secondary in this book to the actual act and pressures of governing. More likely what sets it apart is the brilliance of Bizzinger. As he has demonstrated time and time again, he knows what he is doing. So much to say about this book, but as a small note of praise, the e-reader indicates that I made 45 highlights from this book. I usually don't highlight books ever since finishing undergrad and law school. (What the heck is the point? There is no mid-term in adulthood to prepare for). This one should be assigned in all of your Poli Sci classes. Another important point about this book is that it is very much of its time. Hard to imagine how much the death of the great American City was discussed in the late 90s. Even as late as the 2004 election and the W efforts in the suburbs and exurbs. Cities now are alive and thriving. Indeed, it is suburbs that need your prayers today. Bizzinger hits on so many ideas that are so relevant today (this one belongs up there as much as any of them in understanding the Trump election). Issues like the decline in manufacturing, corporate welfare, crime policy and it's resulting politics of race. I mean this as a great compliment to both Bissinger and Coates, but the red-lining discussion is better here than in Coates' "The Case for Reparations." What is so impressive is that Bissinger had all of this in 1997. Heck, this was even before "The Wire" - which you will see so many echoes. I liked the intimacy of the account. A bit like watching 'The Wire' if not as well executed. At times I felt like the treatment of the city's racial dynamics was fairly one sided but never dishonest or disingenuous. He gave an honest account of the Rendell years in Philly from the perspective of the Rendell administration, and he did spend time on the history of cities in the 20th century and how race played a huge role in outcomes (federal housing policy/redlining/etc). That was a high point. I I liked the intimacy of the account. A bit like watching 'The Wire' if not as well executed. Fascinating look at city administration. A book that would be very different if written today, particularly in (a) some discussions about policing and criminal justice and (b) the over-casual attitude towards sexual harassment and other inappropriate workplace behaviors. Recommend for people interested in Philly or in local government as long as you keep that in mind. Really interesting look at how difficult it is to run a major city, though the racist and classist views of both the author and those he profiles are readily apparent. Required reading for anyone doing impactful work in the city. Such a 90s book. My goodness.
" . . . he understood exactly what a city was about -- sounds and sights and smells, all the different senses, held together by the spontaneity of choreography, each day, each hour, each minute different from the previous one." Oh, the city, the city! I am an urban person. I lived in the suburbs for years and it was hell. You couldn't walk anywhere because there were no sidewalks. There was too much "new". There was too much alike. Your neighbors were just like you. When I drove into the city, th " . . . he understood exactly what a city was about -- sounds and sights and smells, all the different senses, held together by the spontaneity of choreography, each day, each hour, each minute different from the previous one." Oh, the city, the city! I am an urban person. I lived in the suburbs for years and it was hell. You couldn't walk anywhere because there were no sidewalks. There was too much "new". There was too much alike. Your neighbors were just like you. When I drove into the city, the moment I saw the skyline, the outline of the Sears Tower and the John Hancock Center reaching for the clouds, my heart would lift and I would begin to feel alive again. If I have any regret about moving back, it's that I waited too long to do so. Ed Rendell loves Philadelphia. The two-term mayor took a dying city and tried desperately to resuscitate it. And Bissinger was there. In an extraordinary act of transparency, the Rendell administration gave the Pulitzer Prize-winning journalist nearly unfettered access to the mayor and his staff. He was present at meetings public and private, he read documents and correspondence, he interviewed everyone. Mingled with the story of City Hall are the stories of four city residents: a shipyard worker, a grandmother raising her children's children and their children, a policy wonk and a "true believer" prosecutor. They, too, all love the city, and each is subjected to its traumas. Prosecutor McGovern and policy analyst Morrison had options. They could leave for the suburbs, not worry about crime in their neighborhoods or bad schools for their kids. Unemployed welders and inner city moms don't have the same options, and sometimes your love of place makes you want to stay. After all, "there may be lovelier lovelies, but never a lovely so real." When he was sworn in, Rendell had a fight on his hands. The city was losing population, jobs, and industry. Nobody cared. Not the feds. Not the state. He had to make them care. There is the story of the Navy Shipyard, one of the biggest employers in the city for, literally, centuries. For years, it was threatened with being shut down, and, finally, the shutdown came. But a German shipbuilder had a vision, a vision to take the shipyard and turn it into a place that served the burgeoning cruise ship industry. Rendell fought to make that happen. He worked on financing and tax incentives. He went to the State House and he went to the White House. He called in favors and friends. Even when the Governor killed the deal, insulting and humiliating the potential buyer until he said "to hell with you", Rendell kept trying. This is one roller-coaster of a chapter! This is no whitewash of Rendell. Bissinger doesn't shirk from describing the mayor's temper tantrums, his inappropriate behavior towards women reporters, his failures to connect with the African-American community, his egotism. But the picture we have of Rendell as his first term draws to a close is that of a lover who takes his beloved to shows and buys her pretty things, but knows that that, like flowers on an expressway berm, is merely window dressing. It is her heart and soul that matter most, and he will do anything to save her. This page-turner of a book will uplift you, and it will break your heart. Buzz Bissinger doesn't do things halfway. When he wrote Friday Night Lights, he transplanted his entire family to a small town in Texas for a few years. When he wrote A Prayer for the City, he spent over four years shadowing the mayor of Philadelphia and the mayor's top aides. Bissinger fleshes out Prayer with chapters on other Philadelphians. He includes a displaced dock worker, a prosecutor, a disillusioned member of the Rendell administration, and a woman who had raised her children and her g Buzz Bissinger doesn't do things halfway. When he wrote Friday Night Lights, he transplanted his entire family to a small town in Texas for a few years. When he wrote A Prayer for the City, he spent over four years shadowing the mayor of Philadelphia and the mayor's top aides. Bissinger fleshes out Prayer with chapters on other Philadelphians. He includes a displaced dock worker, a prosecutor, a disillusioned member of the Rendell administration, and a woman who had raised her children and her grandchildren and was trying to stay alive long enough to finish raising her great-grandchildren. I thought the author's treatment of Rendell was admirable but ultimately too sympathetic. The mayor's abusive, erratic, overtly sexual behavior sounded disgusting to me but was consistently downplayed by those around him as stress related, misunderstood, etc. Bissinger also seems dismissive of reporters' efforts, which I find strange because he won a Pulitzer reporting for the Inquirer. I don't think it matters whether the newspaper's staffers were pushing hard for a Pulitzer--the voter fraud they uncovered was appalling and has no place in a democracy. Very enjoyable and informative read. If you love cities, urban policy, and history, this one is for you. Give a great nonfiction writer like Buzz Bissinger unfettered access to a colorful and complicated politician like Ed Rendell and you’re going to get an amazing book. I don’t hand out five stars too often but “A Prayer for the City” probably deserves six. This inside look at Rendell’s first term as mayor of Philadelphia is much, much more than a biography of a politician, although it’s a darn good biography. More than anything else, “A Prayer” is a heart-wrenching lamentation about our country’s b Give a great nonfiction writer like Buzz Bissinger unfettered access to a colorful and complicated politician like Ed Rendell and you’re going to get an amazing book. This inside look at Rendell’s first term as mayor of Philadelphia is much, much more than a biography of a politician, although it’s a darn good biography. More than anything else, “A Prayer” is a heart-wrenching lamentation about our country’s betrayal of its big cities, and about the ramifications of that. Bissinger doesn’t shy away from addressing federal policy, in all its wonky and nefarious aspects. But what makes “A Prayer for the City” sing, or make that wail, are its vivid descriptions of how policy affects people on a personal level. Brilliantly, Bissinger devotes much of the book to Philadelphia residents like Fifi Mazzccua, an aging African-American woman who is single-handedly raising a houseful of grandchildren and great-grandchildren while her son rots in prison; or like Mike McGovern, a city prosecutor who confronts the most atrocious acts of violence in the urban cesspool. “A Prayer” also dives into the travails of political leadership in our society, where even the rare, well-intentioned elected official must constantly deal with people who put their self-interest ahead of the common good. If you care about cities – or even if you just care about our country – this book is an important one to read. This book could be placed alongside the television series "The Wire" as the sobering tale of why American cities are doomed. Bissinger does more than wade through the politics and bureaucracy of urban areas, he shows the end game - what those politics mean for the citizens who call cities home. Often, its either, too little, too late or both. 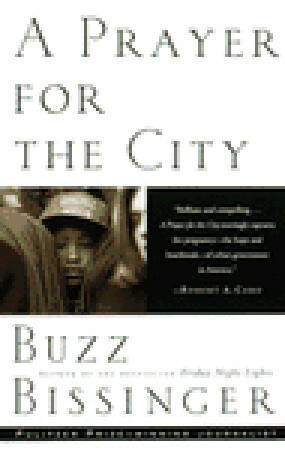 While the book chronicles a mayoral term in the early 90s, you could very easily apply the characters and settings to any present-day major metropolitan ar This book could be placed alongside the television series "The Wire" as the sobering tale of why American cities are doomed. Bissinger does more than wade through the politics and bureaucracy of urban areas, he shows the end game - what those politics mean for the citizens who call cities home. Often, its either, too little, too late or both. While the book chronicles a mayoral term in the early 90s, you could very easily apply the characters and settings to any present-day major metropolitan area in the U.S. While I haven't been around long enough to witness the decline of the American city (I'm only 26), I could never (and still can't) wrap my mind around why the federal government seems so hell-bent on slowly killing urban areas. That's probably the saddest revelation this book uncovered - no matter how qualified the politicians running cities may be, without the help of the federal government (along with the private sector changing its mindframe), it's never going to be enough. As a native of the city talked about in this book (Philadelphia), it gave me a newfound respect for Rendell, David Cohen, and even John Street (who for all intensive purposes was an awful Mayor). I was eager to read this because I moved to Philadelphia during Ed Rendell's first term and now work for the City. Although I'm glad I read it, I was disappointed. One issue I had with the book is Bissinger's writing style. He's a good writer, with ability to convey both narrative and characterization, but he suffers from a need to artificially dress up his prose. The metaphors were so frequent (e.g., two in two sentences) that they became intrusive and the resultant artificiality clogged up his I was eager to read this because I moved to Philadelphia during Ed Rendell's first term and now work for the City. Although I'm glad I read it, I was disappointed. One issue I had with the book is Bissinger's writing style. He's a good writer, with ability to convey both narrative and characterization, but he suffers from a need to artificially dress up his prose. The metaphors were so frequent (e.g., two in two sentences) that they became intrusive and the resultant artificiality clogged up his prose. I would have liked a more detailed explanation of the various events that Bissinger described. For all the leadup to the 1992 battle with the unions, I had no sense of how the City accomplished reforms with the FOP, which settled its contract before DC 33 did, the latter which is the main focus of the first quarter of the book. Contracting out was a concession obtained during the negotiations, but there is very little discussion of how this played out, other than to state the amount of savings obtained and to describe a libertarian Mayoral employee's disillusionment with things not going further. I decided to read this because I don't know much about city-level politics, even less than I know about other types of politics. The author, Buzz Bissinger, spent four years--1992-1995, an entire term in office--following around Ed Rendell and David Cohen, the mayor and chief of staff of Philadelphia. It's a book about Rendell, about his massive and at times almost unbearably painful struggle to rescue his city before it capsized, but it's also a book about Philadelphia and the larger subject of I decided to read this because I don't know much about city-level politics, even less than I know about other types of politics. The author, Buzz Bissinger, spent four years--1992-1995, an entire term in office--following around Ed Rendell and David Cohen, the mayor and chief of staff of Philadelphia. It's a book about Rendell, about his massive and at times almost unbearably painful struggle to rescue his city before it capsized, but it's also a book about Philadelphia and the larger subject of cities and urban culture.